Honda xr dirt bikes, Honda motorcross and enduro off road rides. XR – Xciting Racing - the Honda way. 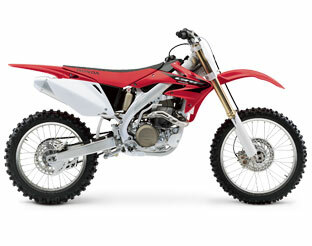 Honda xr dirt bikes, are well proportioned, hard n’ strong machines and ones you should consider. They have four stroke engines, and are ideal for most off roading pursuits. They are however now phased out by the CRF series of dirt bikes built by honda. In essence the bike could be the same and mechanically there is not much difference, apart from updated graphics and plastics. But the used market is full of XR ranges and with some great bargain buys out there, it’s worth seeking these MX bikes out. Are you a moto x rider interested in used moto’s from Honda? The off road experience comes alive, when your racing a Honda xr thats for sure. Caution though - You may need to brush up on a little bit of moto x fitness first, or your body could have a shock at the demands of a dirt & mountain circuit which the specialized XR Honda loves. Even if the bikes are some years old now, a pristine XR in good order will give you the same vigorous workout some of the newer honda motocross bikes can deliver. 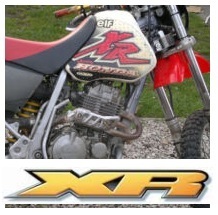 Read up too on the XR using off road publications, and other free web-based MX articles. Take out that magazine subscription or join a moto x club, and you could be championship racing on your Honda XR before you know it! You don’t have to go to a dirt bike salvage yard to pick up super-cheap used Honda xr dirt bikes. Here are some motoX websites, to grab some easy discount bikes. Motors.uk.freeads.net, has a Honda page within their motocross section. Thus bringing up a Honda xr650r for approx £2,595. This MX bike complete with new off road tires had only done a little amount of dirt trail riding; Pro Taper bars and Gold Talon hubs with Excel rims were all inclusive. MOT and tax comes with this dirt bike - so its safe to ride on the road. Also available was a honda xr-250 for sale at £1,500, in almost new condition. The website offers free advice on safe motorcycle purchasing plus good payment procedures of Honda xr dirt bikes & other MX rides as well. Which you don’t often see too much – so we liked this site. HONDA XR rides that tickle the taste buds. If you want to widen the net a bit more and get a Honda xr book or a DVD about the history of Honda what about ebay? It’s also Ideal for kids mini-X rides and other Honda performance parts. But.....this time we looked at dirt bikes on ebay and the Honda xr dirt bikes in particular. A cool looking HONDA XR 125 L-4 with a bid in at £205, with 9 days to go - immediately caught our attention, but sadly was ONLY being sold for spares and repair. Buying a bike like this you really need to know how many accessories and spares will be required. The bike picture in the ad looked genuine enough, but do be sure to ask the seller lots of questions, on what it will take to get this Honda xr back on the track - it could ruin your wallet. Rummaging through bargain motox clothes and cheap moto x boots we discovered a fine HONDA XR 250 with a current bid of £850. Admittedly there was still seven days to go, but it had many accessories thrown in. New pads, new tires, new wheel bearings (front and rear), fork seals and a stainless exhaust - all included. Only 9958 kmh on this off road moto, with tax and test in date for 6 months too. Great for any road riding adventures you have planned, just be sure you can afford the insurance! Other MX stuff such as a 2006 model HONDA XR 125 L-5 in black had a starting bid of £950. It had hardly been ridden and looked to be another unwanted present and the seller needed some garage space back. So as you can see anything from a dirt bike throttle cable to BAD dirt bikes I might steer clear of are all listed. Just don’t get auction (ebay) fever. Bike-exchange.co.uk had a handful of Honda xr dirt bikes. The first Honda XR 125 came in at £1450. Plus an almost new Honda XR 250 was priced to sell for £2000. And a final browse tipped up a Honda XR 600 for around £1200. The site has great descriptions and pics, which really helps with your buying decision. Sometimes muddystuff.co.uk can be worth a quick look, but no Honda xr’s this time - when we entered the site a week ago. And finally our last stop was preloved.co.uk. They had a honda xr 125 on offer at £1,100. Lots of accessories and 9 months MOT and tax was already on the bike. 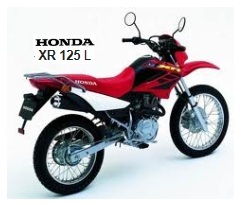 Honda xr dirt bikes are available online AND in good numbers it seems, so if you’re ready for off road adventure or you want to become the star in your own youtube video clips channel. It’s time to decide what Honda xr model you REALLY want to achieve those goals? Your honda dirt bike dealer is always willing to help, but even perfect Honda xr dirt bikes won’t be sold there anymore. Today an XR will certainly be bought from a private seller. That doesn’t mean you have to wave goodbye to your local Honda dealer of course. Spares for your XR motocross bike engine, or that old honda 150cc dirt bike that needs fixing up, will need attention - and your dealer will gladly help you out. 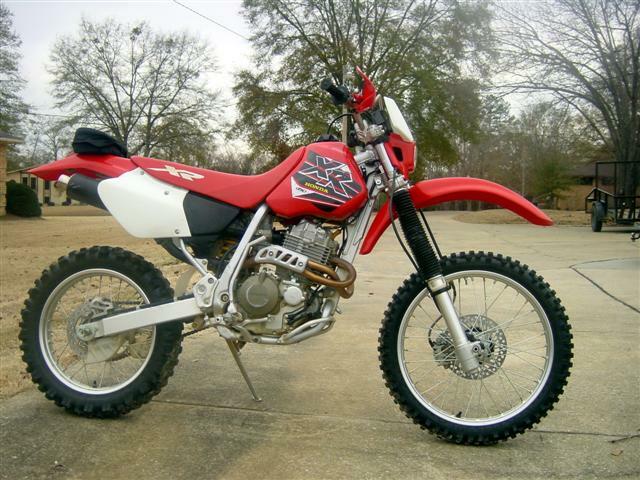 Price is of course paramount for both buying complete Honda xr dirt bikes and their various parts, so if your dealer isn’t competitive enough on costs – searching elsewhere has got a whole lot easier.